The late writer director Michael Cimino’s career was defined by two of his films, the oscar winning The Deer Hunter which made his name and the disastrous Heaven’s Gate which forever tarnished his reputation and bankrupted a studio. Released in 1978 The Deer Hunter was only his second film as a director and its brutal depiction of the Vietnam war and its effect on a group of friends was a world away from his debut film ‘Thunderbolt and Lightfoot’ a lightweight crime drama starring Clint Eastwood. The Deer Hunter was not the first film about Vietnam which at the time had America still reeling from and finding its feet again after the Watergate scandal and resignation of President Nixon. There was a definite feeling in the US that it should never have got involved in Vietnam and The Deer Hunter was decidedly anti war and would soon be followed by a slew of other films with the same view. Jon Voight’s ‘Coming Home’ had been released just a few weeks previously but The Deer Hunter’s depiction of the dehumanizing effects of Vietnam on a group of Pennsylvania steel worker friends who signed up was to traumatize audiences. Cimino’s script spent a long time getting to know the characters. In fact the first hour or so of the film is the friends at work at the steel mill, drinking, laughing and attending a wedding and in turn letting the audience become acquainted with characters who were about to go through hell. And it was hell, most of all for the actors. Cimino pushed them into an uncomfortable shooting environment and downright dangerous scenarios none more so than a sequence on a rope bridge with De Niro and John Savage attempting to be rescued by a helicopter which wound up getting one of it’s runners caught on the bridge and leaving the chopper unable to fly up and away. With the actors clinging onto the runner of the chopper it was now in danger of tipping over into the water and when it did get free the actors then had to do a tombstone drop 60 feet into the filthy river below. If the danger subsided the discomfort increased for the actors as the now captured soldiers imprisoned in cages submerged in the river found the river rats climbing over them. Actor John Savage on one of the discs extras freely admits that he was on the verge of losing it and the scenes of De Niro trying to calm him down needed little acting performances. But if the actors were having a tough time it would soon be the audiences turn next with the infamous Russian Roulette sequences. Almost unbearably tense to watch as the soldiers Christopher Walken, De Niro and savage forced to play by the VietCong hurling abuse as part of a warped betting game amongst them, regarding their prisoners lives as something to be toyed with for their betting pleasure. They are the scenes which audiences came away unable to forget and caused much controversy. Unable to bear the intensity of these scenes many audience members walked out and there were complaints that the VietCong never forced captured US soldiers to play but its undoubtedly the most striking part of The Deer Hunter. By the time the film was being shot in 1977 De Niro had rightly secured a reputation as the greatest actor of his generation having appeared in Scorsese’s Mean Streets and Taxi Driver and appeared in Coppolla’s The Godfather Part 2, one of the greatest sequels ever made for which he won his first Oscar as Best Supporting Actor. The Deer Hunter had him as the ever reliable centre of the group of friends and the film was a world away from his previous film, ‘New York, New York’, director Scorsese’s only straight out musical. Despite the arduous shoot for The Deer Hunter De Niro would go on to put himself through further turmoil in his preparations for Raging Bull and what would be his massive weight gain for that role which many modern actors use as a bench mark for method acting. Also appearing in the film was a young actress called Meryl Streep in her first decent lead role and would star alongside John Cazale, her boyfriend at the time. Cazale had appeared in only a few films but nearly all of them were seminal films of the seventies and included the first two Godfather films, Coppolla’s The Conversation and Dog Day Afternoon with Al Pacino. The Deer Hunter would be his eighth and last film. 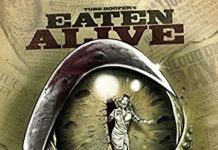 He had terminal cancer and was dying and his casting put the financing of the film in jeopardy with the money men wary that he would not even live to the end of filming. In fairness to Cimino he stuck by Cazale insisting that he was keeping him in the film. Cazale died a month after the film was released in February 1978. It was Christopher Walken though who would find The Deer Hunter propelling him to star status as the friend clearly suffering from PTSD and with a death wish addicted to playing Russian roulette. Dead eyed and dehumanized by what he’s seen and done the performance would win him his only Oscar for Best Supporting Actor. It was one of five oscars that The Deer Hunter would win including Best Film, Director, Sound and Editing. 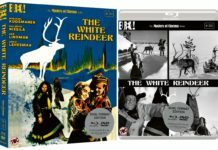 The 40th Anniversary release is its first ever 4K restoration and the blu ray version is a two disc release with a collector’s edition having 4 discs including the original soundtrack. Though Cimino died back in 2016 there are plenty of retrospective interviews with him including a 1979 South Bank Show where he talks to Melvyn Bragg about the film. He also features in one of several featurettes ‘Realising the Deer Hunter’ where Cimino talks about how problematic the film was to shoot and the disc still has his commentary. ‘Playing the Deer Hunter’ has actor John Savage talk about the experience of making the film something which he’s never shaken off as he grows visibly upset as he recounts the experience and how much he grew to rely on De Niro to get him through it. Less successful is the interview with the late cinematographer Vilmos Zsigmond who also died in 2016 mainly because his heavy accent makes it difficult to understand what he’s saying and his commentary with journalist Bob Fisher is not the easiest of listens. 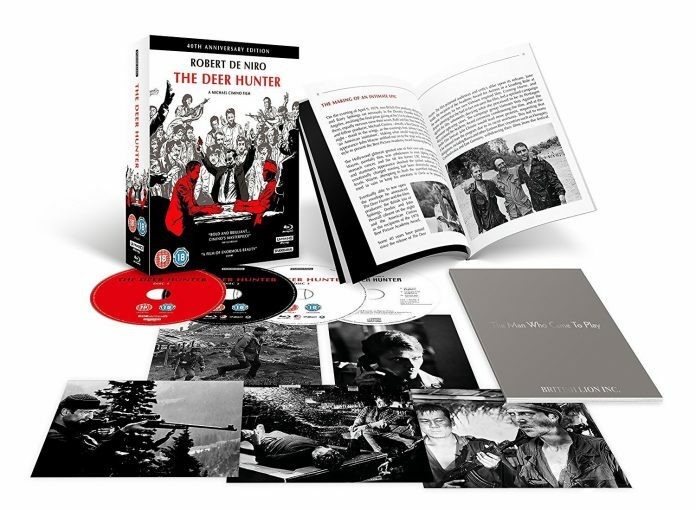 Also included in the disc are a number of deleted scenes including the further Russian roulette moments and critic David Thompson gives a somewhat dry account of the first press screening of The Deer Hunter which hints at what was about to be unleashed on the public. At times The Deer Hunter is a brutal viewing experience that contrasts sharply with its beautifully delicate guitar score by the under rated Stanley Myers. This collectors edition of the film is about as good as it’s going to get packed with decent extras and even lobby cards with scenes from the film. 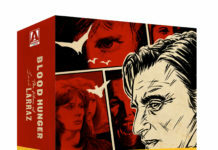 Here’s The Deer Hunter trailer…..